Please Support Chase’s supporters, thank you !! Osteosarcoma (OSA) is the most common bone tumor in dogs and is associated with a highly aggressive behavior. Currently, the best survival times are achieved with surgery and chemotherapy, although survival is still only 8-12 months. A number of genetic alterations have been associated with osteosarcoma, but a better understanding of how genetic alterations contribute to OSA development and metastasis (spread) is needed. Dr. Stein will be investigating the role of these genetic alterations which eventually could lead to future therapies. 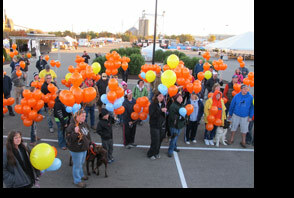 High-dose, conventional chemotherapy has been a mainstay of cancer treatment for both people and pets. However, this form of chemotherapy generally provides only minimal gains in survival and is frequently associated with significant side effects. Daily low-dose, or metronomic, chemotherapy protocols have been recently investigated in humans and animals and have been shown to decrease the blood flow to tumors (called angiogenesis) which is critical for tumor growth. This type of chemotherapy also causes fewer side effects. Dr. Biller will be studying whether or not a combination of both high and low-dose chemotherapy could result in longer survivial times for dogs with cancer. 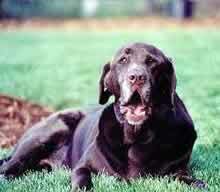 Canine hemangiosarcoma (a tumor of blood vessel lining cells) represents one of the deadliest cancers that affect dogs. While there is predilection for certain organs such as the spleen, skin and heart, these tumors can arise in any organ, they are highly metastatic, and they are poorly responsive to conventional therapies. The common prevalence and poor response of this tumor have led many groups to test new experimental therapies, including metronomic chemotherapy, various anti-angiogenic strategies, the histone deacetylase inhibitor (DNA modifier) SAHA (vorinostat), immunotherapeutic approaches, protein tyrosine kinase inhibitors, and others. While these approaches have reported anecdotal success, none have shown conclusively that they can produce equal or better responses than the current standard of care (surgery plus cytotoxic chemotherapy). During the last decade, human medicine has witnessed the emergence of the new generation of cancer drugs, which were rationally designed to block pathways crucial to tumor growth. One eloquent example is the inhibitors of angiogenesis (the ingrowth of new blood vessels into the tumor). All tumors need a blood supply to provide rapidly dividing cancerous cells with oxygen and nutrients. The task of generating new vessels is two-fold: it requires an increased production of pro-angiogenic molecules and a decreased production of anti-angiogenic molecules. The chief proangiogenic molecule is a protein called VEGF (for Vascular Endothelium Growth Factor.) The chief anti-angiogenic molecule is a protein called TSP (for ThromboSPondin.) That most tumors go to extraordinary lengths to overproduce VEGF and silence TSP attests to the significance of these molecules. In our proposal we will focus on three complementary Aims. 1. To generate canine “VEGF trap” proteins capable of binding and sequestering this pro-angiogenic factor. This will be achieved by artificially truncating naturally occurring cell membrane-bound form of VEGF sensors (known as VEGF receptors). The truncated forms typically do not possess pro-angiogenic activities. Instead they channel VEGF into dead-end protein-protein interactions. 2. 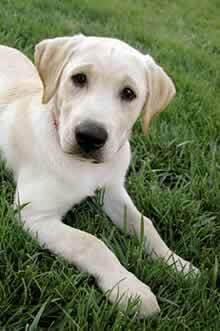 To test anti-angiogenic activities of polypeptides based on the canine thrombospondin-1 protein. Experimental tumors will be treated with either polypeptides themselves or DNA fragments encoding such peptides. 3. To identify molecules capable of re-activate endogenous (tumor-produced) thrombospondin. a) compounds that directly increase the half-life of thrombospondin-1 messenger RNA; b) compounds that increase the half-life of the protein called p53, which is the major activator of thrombospondin. New volunteer run store is open for business with more items coming soon : T-shirts, New Sweatshirts, Dog Collars and Leashes in stock now !!! 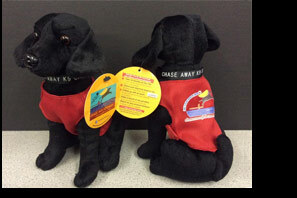 Donations and proceeds of merchandise help support canine cancer studies. 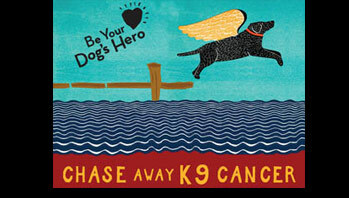 Take a few minutes on the 14th of each month to Do a Check to Chase Away K9 Cancer. Early detection may affect prognosis and treatment! The content provided on this website is for informational purposes only and not intended to replace the advice of your veterinary professional. Please seek the advice of your veterinary professional before proceeding with any treatment or therapy.